(NARRATOR)>> TODAY ON XOR ELIZA AND JEREMY ARE TEARING INTO THEIR OVERLAND SCOUT PROJECT, AND THEIR PRERUNNER RANGER. 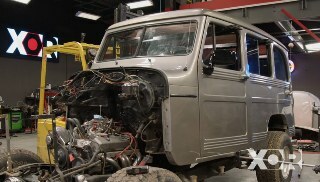 WE'LL TEST DRIVE OUR '79 SCOUT BEFORE TEARING IT APART AND STARTING ON THE BODY. THEN WE'LL RIP OUR RANGER APART TO SHOW YOU HOW WE'RE GONNA MAKE A DESERT PRERUNNER. (JEREMY)>> HEY GUYS, WELCOME TO XOR, I'M JEREMY. (ELIZA)>> AND I'M ELIZA. 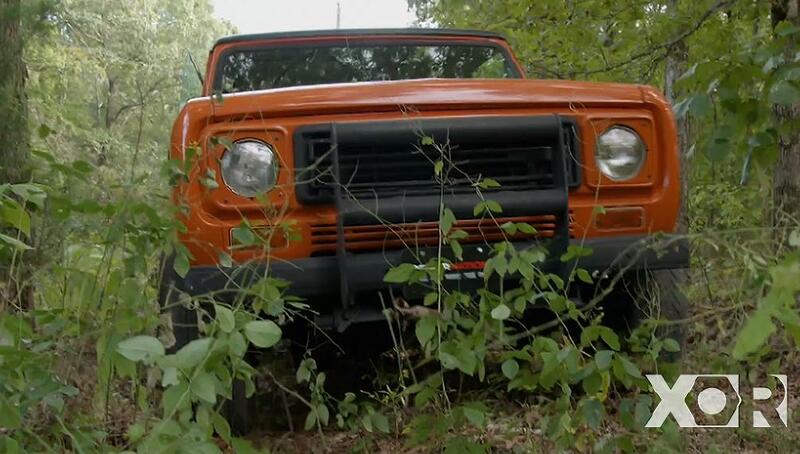 WE'VE GOT A LOT OF COOL PROJECTS COMING AT YOU THIS SEASON, LIKE OUR '79 SCOUT. WE ALSO HAVE A BUNCH OF OTHER RIDES THAT WE PLAN ON BUILDING UP AND TRAILING. (JEREMY)>> THAT'S RIGHT, WE PLAN ON TAKING THESE THINGS TO SOME PRETTY COOL PLACES TO PAY THEM OFF. WE PLAN ON TAKING YOU THROUGH THE HILLS, RUNNING YOU THROUGH THE DESERT, AND DRAGGING YOU THROUGH THE MUD. (ELIZA)>> NOW YOU'RE PROBABLY WONDERING, WHO THE HECK ARE WE? WELL HERE'S A LITTLE BIT ABOUT US. (JEREMY)>> HI, I'M JEREMY WECKMAN. I'M A WELDER, FABRICATOR, PAINTER, AND I LOVE BUILDING STUFF OUT OF METAL. I HAVE A PICTURE OF MY DAD AND OUR TWO STALL GARAGE. WE HAD AN OLD LIKE MID '80'S BRONCO, AND MY DAD HAS TO PUT AN ENGINE IN IT. SO I WAS PROBABLY LIKE EIGHT OR NINE, AND MY MOM WALKED OUT AND TOOK A PICTURE AND I'M SITTING IN THE ENGINE BAY, AND THE ENGINE'S HALF TORN APART. THAT'S PROBABLY MY FIRST REAL AUTOMOTIVE TYPE MEMORY. I REALLY DO LIKE TEACHING. I LIKE HELPING OTHER PEOPLE LEARN. LIKE IN MY SHOP, SHOWING HOW I'M GONNA MAKE A METAL PIECE AND FAB IT UP, AND THEN YOU KNOW, THEY'RE STANDING THERE WATCHING SOMETHING QUICK AND THEY'RE LIKE, WOW, I HAD NO IDEA THAT'S HOW YOU DID IT. YOU KNOW YOU CAN TEACH ANYBODY ANYTHING IF THEY HAVE THE INTEREST IN IT. HOPEFULLY WE CAN JUST ALL GROW AS ONE BIG FAMILY AND I CAN HELP A BUNCH OF PEOPLE OUT. THAT'D BE BEST. (ELIZA)>> HI, I'M ELIZA LEON. I'M A GEARHEAD, FABRICATOR, WELDER, AND OBSESSED WITH OFF ROADING. ALL THE MEN IN MY FAMILY ARE MECHANICS. SO I ALWAYS AROUND TRACTORS, BIG TRUCKS, 18 WHEELERS, AND MY UNCLE'S FOUR WHEEL DRIVES. I HAVE TO SAY WHAT CAUGHT ME THOUGH WAS MONSTER TRUCKS. I MUST HAVE BEEN FIVE OR SIX WHEN I WENT TO ONE OF THE FIRST SHOWS AND I WAS IN LOVE. IT WAS AN ADDICTION SINCE THEN I THINK. I HAVE A '59 WILLYS PICK UP TRUCK, I HAVE A '91 KFIVE BLAZER, AND MY JK WRANGLER. I HAD A '77 GMC AND I SOLD THAT AND I SHOULDN'T HAVE. I MISS THAT ONE, BUT YEAH, I HAVE A COLLECTION GOING. I'M GONNA BE THE OLD TRUCK LADY. INSTEAD OF THE OLD CAT LADY, OLD CRAZY CAT LADY, I'M GONNA HAVE A YARD FULL OF TRUCKS. AND SO NOW THAT I'M HERE IT'S LIKE OH MY GOSH. IT'S AN HONOR AND IT'S A BIG RESPONSIBILITY AT THE SAME TIME. GROWING UP IT'S WHAT I WATCHED, AND THAT DEFINITELY MOLDED HOW I TOOK TO PRODUCT, AND TOOK TO BUILDS AND STUFF. SO NOW I KNOW THAT I'M IN THOSE SHOES OF WHERE I'M HELPING MOLD THE NEXT CAR ENTHUSIAST, THE NEXT OFF ROAD ENTHUSIAST. (JEREMY)>> NOW THAT YOU KNOW A LITTLE BIT MORE ABOUT US, LET US TELL YOU A LITTLE BIT MORE ABOUT OUR PROJECTS. YOU'VE ALREADY SEEN THE SCOUT, BUT THIS INTERNATIONAL SHOULD MAKE A GREAT PLATFORM FOR AN OVERLAND TYPE BUILD. WE WANT TO BE ABLE TO DRIVE THIS THING TO OUR DESTINATION, HAVE SOME FUN WITH IT, AND MAKE SURE IT GETS US BACK HOME. SO A MILDLY BUILT LS TURNING OVER SOME 37 INCH TALL TIRES AND SOME STOUT AXLES SHOULD DO THE TRICK. WE'RE ALSO GONNA PUT THE TOP BACK ON IT, INSTALL A ROOFTOP TENT SYSTEM SO YOU AND THE FAMILY CAN STAY WHEREVER YOU LAND. NOW THIS TRUCK SHOULD BE PRETTY VERSATILE WHEN WE'RE DONE WITH IT. WE'RE JUST NOT SURE ABOUT THE COLOR YET. (ELIZA)>> AND HERE IN OUR TWO CAR GARAGE IS OUR 1953 WILLYS WAGON. IN 1940 WORLD WAR TWO CALLED FOR AN ALL PURPOSE OVER EVERYTHING VEHICLE. THE MB FLAT FENDERED JEEP WAS THE ANSWER TO THE THAT CALL, AND THAT IS HOW OVERLAND WILLYS WAS BORN. NOW IN 1941 WILLYS OFFERED THE JEEP, THE JEEPSTER, THE WAGON, AND THE PICK UP TRUCK TO THE CIVILIAN MASSES. NOW THIS WILLYS WAGON HERE IS GOING TO BE OUR HIGH HORSEPOWERED MUD SLINGING TERROR. NOW MOVING OVER TO THE RANGER. THIS '01 EXTENDED CAB PROVIDES GREAT BONES FOR A PRERUNNER PROJECT. ONE OF THE BEST SELLING MID SIZED TRUCK THAT FORD OFFERS WAS EXACTLY WHAT WE NEEDED IN SIZE, WHEEL BASE, AND UTILITY FOR HIGH HORSEPOWER AND LONG TRAVEL SUSPENSION. NOW IT MAY NOT LOOK LIKE MUCH RIGHT NOW, BUT THIS RANGER WILL BE FLYING OVER THE DUNES. (JEREMY)>> ALL RIGHT GUYS, ALL THIS STUFF CAME OUT OF THE SCOUT AND WE'RE NOT GONNA USE ANY OF IT. SO IT'S GOT TO GO. PLUS THERE'S SOME BODY WORK WE HAVE TO TAKE CARE OF. SO LET'S GET TO WORKING. (JEREMY)>> AND TYPICAL OF THESE OLD SCOUTS, WATER TENDS TO POOL DOWN IN THESE BOTTOM COWL AREAS AND CREATES A LOT OF PROBLEMS, AND SINCE NOBODY REPOPS THE PART WE'RE GONNA HAVE TO FIX IT OURSELVES, AND THE REPAIR IS ACTUALLY PRETTY SIMPLE. (ELIZA)>> AND JEREMY'S RIGHT. WE'RE GONNA TAKE SOME MEASUREMENTS, USE CARD STOCK TO MAKE PAPER TEMPLATES SO THAT WE CAN CUT SOME SHEET METAL TO MAKE OUR PATCH PANELS. (JEREMY)>> NOW THE GREAT THING ABOUT CARD STOCK IS IF YOU MESS UP THE PATTERN YOU CAN JUST THROW IT AWAY AND START OVER WITH A NEW PIECE. WHEN IT'S RIGHT YOU CAN JUST FLATTEN IT OUT AND TRANSFER IT TO YOUR SHEET METAL. IT SHOULD GO WITHOUT SAYING, BUT YOU NEED TO CHECK YOUR CUT SHEET METAL AGAINST YOUR PATTERN. NOW WITH THE BREAK IT'S A GOOD IDEA TO, AS WE SAY, UNDER BEND YOUR PIECE, CHECK IT, AND ADD A LITTLE MORE TO GET THAT PERFECT FIT. (JEREMY)>> WE'RE STOPPING THE RUST WITH DUPLICOLOR'S RUST FIX. WE'RE GONNA HIT IT WITH THREE LIGHT COATS, AND IT'S READY TO WORK WITH IN AN HOUR. RUST CONVERTERS APPLIED TO AREAS LIKE THIS CONVERT THE IRON OXIDE TO IRON TANNATE, MAKING IT AN INERT SURFACE. FOR STRONG TACKS WE LIKE TO CUT THE TIP OFF OF OUR WIRE BETWEEN EACH INITIAL TACK. THIS GIVES US AN INSTANT ARC AND PROVIDES A CLEAN, STRONG, WELD. USING COMPRESSED AIR TO COOL DOWN THE AREA HELPS PREVENT THE PANEL FROM WARPING. (ELIZA)>> #$@í, BURNED A HOLE THROUGH THAT ONE. (NARRATOR)>> UP NEXT WE'LL SHOW YOU HOW THE SCOUT DID BEFORE WE TORE IT APART, AND LATER OUR PRERUNNER RANGER GOES UNDER THE KNIFE TO BEGIN ITS TRANSFORMATION INTO A DESERT RACER, STAY TUNED! (ELIZA)>> HEY GUYS, WELCOME BACK TO XOR. WE JUST FINISHED PUTTING IN OUR PATCH REPAIR PANELS ONTO THE COWL, BUT WE STILL HAVE A LONG WAYS TO GO ON THE RUST REPAIR PROCESS. (JEREMY)>> OH YEAH, NOW BEFORE WE DUG INTO THIS TRUCK WE GOT TO TAKE IT OUT ON A LITTLE TEST DRIVE, AND IN ITS STOCK FORM IT DEFINITELY WASN'T UP TO OUR STANDARDS. CHECK THIS OUT! (JEREMY)>> LET'S PICK THE HOTTEST DAY OF THE YEAR WITH A BLACK TOP TO GO OUT FOR A DRIVE WHEN THE AIR CONDITIONING ISN'T HOOKED UP ANYMORE. OH, LISTEN TO THE RUMBLE, HERE WE GO! (ELIZA)>> GO, GO, GO, GO! (JEREMY)>> BOMBA, BOMBA, BOMB, BOMB! (ELIZA)>> JUST WAITING FOR IT TO BACKFIRE LIKE IT DID EARLIER. OH MY GOD, I TOTALLY FEEL THE SUSPENSION HAS A BUNCH OF ROLL. 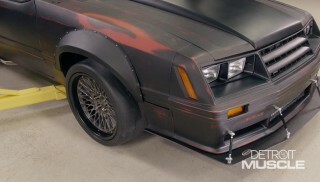 (JEREMY)>> YEAH, IT'S NOT A VERY CAPABLE OFF ROAD VEHICLE RIGHT NOW, BUT IT WILL BE. (ELIZA)>> NOT ONLY DID WE FIND OUT OUR SCOUT WAS WOEFULLY UNDERPOWERED, THE SUSPENSION WAS LIKE A BAD CARNIVAL RIDE. HALF OF THE FOUR WHEEL DRIVE WORKED AND THE A/C, WELL IT JUST NEVER SHOWED UP. (JEREMY)>> SO OUR PLAN IS TO MAKE THIS AN OVERLAND VEHICLE. IT'S NOT GONNA BE A ROCK BOUNCER, BUT IT IS GONNA HAVE TO GET US TO OUR CAMPING SPOT, AND TACKLE WHATEVER MAY BE IN THE WAY. (ELIZA)>> WE'RE GONNA ADDRESS POWER FIRST BY ADDING A 400 PLUS HORSE LS. (JEREMY)>> AND WE'LL MAKE SURE THAT ALL OF THAT POWER GETS TO ALL FOUR TIRES. (ELIZA)>> WE'LL TEAR OUT THE SCARY SUSPENSION AND ADD NEW AXLES, BIGGER SPRINGS, AND A VERY CAPABLE WHEEL AND TIRE COMBO. (JEREMY)>> BUT IT WAS STILL FUN TO TAKE THIS THING OUT AND SEE WHAT WE HAD TO START WITH, EVEN WITHOUT THE A/C. IT STEERS ALL RIGHT AND IT GOES DOWN THE ROAD OKAY. (ELIZA)>> THAT'S ALL WE CAN ASK FOR. (ELIZA)>> A WHOLE LOT MORE ONCE YOU GET THROUGH WITH IT. (JEREMY)>> GET ME OUT OF THIS THING, I'M DYING! (ELIZA)>> WE'RE GONNA GET IN TROUBLE FOR THAT. IT'S HOT, IT'S HOT! (JEREMY)>> IT'S HOT IN THERE DUDE! IT'S NICE OUT HERE. (ELIZA)>> UNA MAS CERVEZA POR FAVOR! (NARRATOR)>> AFTER THE BREAK WE'LL LAY OUT OUR PLANS FOR OUR DESERT PRERUNNER PROJECT, STICK AROUND. (JEREMY)>> HEY GUYS, WELCOME BACK TO XOR. WE THOUGHT WE'D TAKE A BREAK FROM THE SCOUT TO TALK A LITTLE BIT MORE ABOUT OUR NEXT PROJECT. THIS IS THE 2001 FORD RANGER. THIS THING'S HAD A PRETTY ROUGH LIFE, BUT WHEN WE'RE DONE WITH IT IT'S GONNA MAKE A PRETTY COOL PRERUNNER. (ELIZA)>> PRERUNNER IS A TRUCK THAT WAS INTENDED TO SURVEY THE COURSE BEFORE RACE DAY FOR TROPHY TRUCKS, BUT AS WITH ALL COMPETITIONS, THIS TRUCK HAS NOW BECOME A NEW CLASS OF ITS OWN. NATURAL HABITAT FOR A PRERUNNER, MAN MADE RACE COURSES BOTH COMPRISED OF DIRT AND STREET TRACK, THE SOUTHWESTERN DESERT, AND BAJA PENINSULA. POPULATION, THOUSANDS AND MULTIPLYING FAST. WHAT MAKES THESE TRUCKS COMPLETELY AWESOME? LONG TRAVEL SUSPENSION THAT CAN HANDLE A BRUTAL BEATING OF SPEEDS OF 80 MILES PER HOUR OR MORE, FIBERGLASS AND WHEEL WELL FOR DAYS, THE ABILITY TO FLY OVER OBSTACLES AND LAND THEM WITH LITTLE TO NO DISTURBANCE TO THE DRIVER, TOP NOTCH GPS AND NAVIGATION SYSTEMS, GO ANYWHERE SETUP WITH MAXIMUM HORSEPOWER, KNOBBY TIRES LOCKED IN WITH BEADLOCKS, AND FUEL AND SPARE TIRES TO COVER 18 PLUS HOUR COURSE. MANY MID SIZE AND FULL SIZE TRUCKS OF ALL MAKES AND MODELS ARE SUITING UP AND STEPPING INTO THIS FAST PACED AND HIGH ADRENALINE FUN. NOW THE COOL THING ABOUT THIS PROJECT IS THAT JEREMY AND I ARE KEEPING THIS AS A GARAGE BUILD. WE'RE GONNA SHOW YOU HOW TO BUILD A PRERUNNER WITH TOOLS THAT YOU MAY ALREADY HAVE OR CAN EASILY ACQUIRE. NOW DON'T UNDERESTIMATE THIS TRUCK CAUSE WE ARE NOT SKIMPING ON THE POWER PLANT. 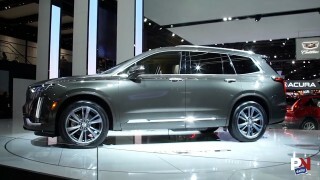 (JEREMY)>> NOW WHAT'S COOL ABOUT THIS THREE LITER VSIX IS THAT FORD PUT EVERYTHING ON IT THAT THEY COULD OFFER. IT'S GOT POWER STEERING, AIR CONDITIONING, IT'S FUEL INJECTED, AND IT' PURRS LIKE A KITTEN. (ELIZA)>> YOU KNOW WHAT'S AWESOME ABOUT IT ALL? IT'S ALL GOT TO GO! SO WE HAVE TO MAKE ROOM FOR OUR NEW DRIVETRAIN AND SUSPENSION. SHOCK HOOPS ARE GONNA BE COMING IN RIGHT ABOUT HERE. SO THIS ALL HAS TO DISAPPEAR. (JEREMY)>> AND WE'VE GOT A COOL LITTLE VEIGHT PLANNED FOR THIS. SO WE'RE GONNA SLAM THAT UNDERNEATH THE HOOD. (ELIZA)>> AND JUST LIKE UP FRONT, ALL THIS INTERIOR HAS TO GO. 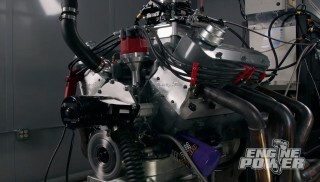 THAT VEIGHT IS GONNA MAKE QUITE A BIT OF HORSEPOWER. SO WE NEED TO THINK ABOUT SAFETY. 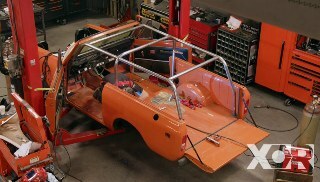 ROLL BAR, RACE SEATS, FIVE POINT HARNESS AND NAVIGATION SYSTEM, THAT'S JUST THE BEGINNING. WE HAVE TO MAKE ROOM FOR A BATTERY BOX, FIRE EXTINGUISHER, TAKE OUT THE GLASS AND GET NETTING BECAUSE WE ARE NOT GONNA BE GENTLE ON THIS KITTY. (JEREMY)>> AND THIS LITTLE KITTY'S GOT TO FLY. SO WE'VE GOT TO GET RID OF SOME WEIGHT. SO THIS BOX HAS GOT TO GO. PLUS IT'S GONNA MAKE WAY FOR OUR SUSPENSION THAT'S GOING UNDERNEATH THIS TRUCK CAUSE WHAT'S UNDERNEATH IT NOW ISN'T GONNA WORK OUT. IN ITS STOCK FORM THE RANGER HAS GREAT RIDE ON PAVEMENT, BUT WHAT WE ARE LOOKING FOR IS MAJOR SUSPENSION TRAVEL BOTH FRONT AND REAR SO IT CAN SOAK UP THE BUMPERS OF THIS FUTURE HIGH FLYING MACHINE. NOW TO MAKE WAY FOR THIS LONG TRAVEL SUSPENSION WE'VE GOT TO GAIN SOME CLEARANCE. SO THE FRONT CLIP HAS GOT TO GO, AND WHEN IT COMES TIME TO HANG THE FIBERGLASS BACK ON THIS TRUCK WE'RE GONNA HAVE TO BEND HER OUT ANYWAYS. SO WE'RE GONNA FAB UP A KILLER ROLL CAGE AND AN AWESOME SPARE TIRE CARRIER CAUSE THIS THING HAS GOT TO LOOK AS GOOD AS IT PERFORMS. (ELIZA)>> AND WHEN WE COME BACK WE'RE GONNA FINISH TEARING INTO THIS THING AND GET THIS PARTY STARTED. (JEREMY)>> ABSOLUTELY, AND WE'RE GONNA SHOW YOU HOW TO MODIFY YOUR STOCK REAR SUSPENSION, ADD TWO LONGER LEAF SPRINGS AND GAIN 18 INCHES OF TRAVEL, SO STICK AROUND! (JEREMY)>> HEY GUYS, WELCOME BACK TO XOR AND THE TEARDOWN OF OUR PRERUNNER RANGER. (JEREMY)>> LIKE WE SAID BEFORE, MOST OF THIS STUFF ISN'T GONNA BE USED. SO IT'S EITHER OFF TO THE JUNKYARD OR THE SWAP MEET. (JEREMY)>> NOW YOU CAN TELL THAT SOME OF THIS TRUCK HAS NEVER BEEN APART. SO SOMETIMES YOU NEED A LITTLE HELP. NOW YOU COULD CUT THE WIRING HARNESS COMPLETELY OUT OF YOUR TRUCK. WE JUST CHOSE TO KEEP IT CAUSE WE MIGHT NEED IT JUST A LITTLE LATER. (ELIZA)>> SOMETHING EASY TO FORGET WHEN REMOVING YOUR TRUCK BED IS TO DISCONNECT YOUR FUEL FILLER NECK. AND JUST LIKE YOUR FUEL FILLER NECK, DON'T FORGET TO DISCONNECT THE WIRING HARNESS THAT RUNS TO YOUR TAILLIGHTS. (ELIZA)>> OH MY GOD, THANK GOD! (JEREMY)>> THIS IS THE SUSPENSION THAT'S UNDERNEATH THE RANGER RIGHT NOW, BUT WHAT WE PLAN ON DOING IS TAKING THE REAR SHACKLE MOUNT, FLIPPING IT OVER, AND WE'RE ALSO GONNA FLIP THE SHACKLE ITSELF OVER AND ADD THE LONGER SHACKLE. WHAT THAT'S GONNA DO IS LET THE SPRING FALL AWAY FROM THE TRUCK, GIVING US MORE TRAVEL. WE'RE ALSO GONNA BE GOING TO A 64 INCH CHEVY SPRING. SO WE HAVE TO PUSH THE FRONT MOUNT FORWARD SO WE CAN GAIN ALL OF THAT MOVEMENT. 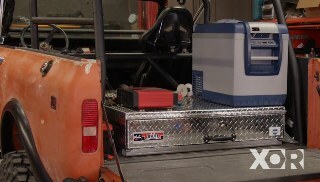 NOW ONE THING ABOUT CONVERTING OUR RANGER INTO A PRERUNNER, TO PASS TECH, WE CANNOT USE OUR OEM FUEL TANK. SO THIS IS WHAT WE'RE USING, A FUEL CELL. NOW THE REASONS WHY WE'RE USING A FUEL CELL IS BECAUSE IT'S SAFER, IT'S STRONGER, HAS ALL THE PORTS FOR OUR FUEL INJECTION, AND WE CAN MOUNT IT ANYWHERE. NOW THERE'S A LOT GOING ON HERE. SO LET ME TELL YOU WHAT WE'VE GOT. NOW ALL THE PORTS HAVE A PURPOSE. THE BOTTOM PORTS ARE FOR THE FUEL OUTLET. THEY SIT LOW IN THE TANK, AND YOU SHOULD FACE THEM TOWARDS THE REAR OF THE TRUCK. THAT WAY WHEN YOU STOMP ON THE THROTTLE ALL THE FUEL RUNS TOWARDS THE FITTINGS. THE PORTS ON THE TOP DO TWO DIFFERENT THINGS. 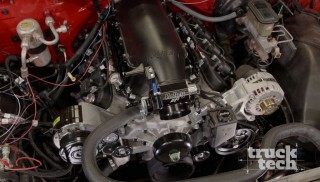 ONE IS FOR YOUR RETURN LINE FROM YOUR FUEL SYSTEM, AND THE OTHER ONE IS A SAFETY ROLL OVER VALVE AND A VENT COMBINED. THE CAP COVERS A LARGE DIAMETER HOLE TO HELP YOU REFUEL QUICKLY, AND HAS A SAFETY LATCH TO KEEP IT IN PLACE, AND LASTLY WE HAVE THE FUEL SENDING UNIT. THIS IS WHAT'S GONNA TELL US HOW MUCH FUEL'S IN OUR TANK. AND INSIDE OF HERE IT'S NOT JUST AN EMPTY TANK. INSIDE THE CELL THERE ARE ACTUALLY ANTISLOSH MEASURES. FIRST THERE'S SOME ALUMINUM BAFFLES, AND ON THE SIDES AND BOTTOM OF THE TANK THERE'S ACTUALLY FOAM. THIS FOAM NOT ONLY HELPS WITH SLOSHING, IT ALSO HELPS KEEP THE FUEL POOLED IN THE LOWER SUMP. NOW THERE'S MANY DIFFERENT SIZES OF FUEL CELLS. YOU CAN ACTUALLY EVEN GET A FUEL CELL THAT'LL BOLT INTO YOUR STOCK LOCATION, BUT FOR OUR USE WE WENT WITH A SQUARE STYLE FUEL CELL BECAUSE WE CAN PRETTY MUCH MOUNT IT ANYWHERE WE WANT TO. THEY ALSO MAKE DIFFERENT TYPES OF FUEL CELLS. THERE'S ALUMINUM, STEEL, AND PLASTIC. WE CHOSE ALUMINUM TO HELP REFLECT THE SUN IN THAT HOT DESERT HEAT. NOW WE PLAN ON MOUNTING OUR FUEL CELL HIGH AND IN BETWEEN THE FRAME RAILS. WE'RE ALSO GONNA SHIFT IT TOWARDS THE BACK OF THE TRUCK. THAT'S GONNA HELP WITH WEIGHT TRANSFER. WE'RE ALSO GONNA BUILD A CAGE AROUND OUR FUEL CELL, AND THAT'S GONNA KEEP IT SAFE FROM ROCKS AND DEBRIS, OR IF SOMETHING IN THE SUSPENSION FAILS. NOW WE HAVE TO KEEP IN MIND WHERE OUR AXLE'S GONNA TRAVEL. SO INSTALLING OUR FUEL CELL BEHIND THE AXLE IS KEY CAUSE WE DON'T WANT THIS THING CONTACTING THAT THING. NOW WITH ALL THAT SAID, WE'RE GONNA GO AHEAD AND GET RID OF THIS OEM FUEL TANK. WE DON'T WANT ALL THAT WEIGHT ON THE DRIVER'S SIDE OF THE TRUCK OR TOWARDS THE CENTER ANYWAYS. THAT'S WHY WE CHOSE TO PUSH THIS ONE BACK. NOW THE BIG MESSAGE HERE IS SAFETY. THAT'S WHY YOU GUYS HAVE GOT TO CHOOSE THE RIGHT FUEL CELL FOR YOUR APPLICATION, BECAUSE IF YOU THINK ABOUT APPLICATION, THINK ABOUT LOCATION, THINK ABOUT SAFETY, AND THINK ABOUT FUEL DELIVERY BEFORE YOU GET OUT ON THE COURSE THEN YOU CAN JUST CONCENTRATE ON WINNING AND NOT THINK ABOUT ANYTHING ELSE.